Note: Every other Thursday I contribute to a shared column, PATCH work, Three Gardens, Many Kitchens, in our local newspaper, The Addison Independent. This week I’m thinking artichokes–here’s how it reads with its images (the online newspaper version does not include the visuals). As a child I wanted swordfish and artichokes for my birthday dinner. I can’t imagine what came over me to ask for swordfish, but I still crave artichokes every spring the way my mother fixed them: steamed whole, upside down. Perhaps I loved them because they were expensive and made their appearance in northern New England groceries so briefly. Perhaps I loved that they came all the way from California. More likely it was the pool of lemony butter and the messy business of taking the flower apart, leaf by leaf, dipping the soft ends into the butter, scraping them with my teeth, and then tossing them into a big bowl in the center of the table. It wasn’t often we got to throw food around as part of dinner. And then there was the fun of uncovering the heart hiding beneath the fuzzy choke. I would let it swim about in the butter and then cut it into bits to make it last. Back then I didn’t know that some people had never seen one. My husband saw his first artichoke when he came east for college. My sister-in-law from the Northeast Kingdom first encountered them at our table when my brother brought her home to meet us. Embarrassed and clueless about what to do with the giant bud on her plate, she watched and imitated, peeling off a leaf and popping it in her mouth. What she didn’t know is that you don’t eat the toughest outer leaves, nor do you bite off the ends and chew them. When I lived in California, I saw them growing in vast fields stretching across a hot flat valley, tall bushy plants with huge serrated leaves, each with a dozen or more artichokes at the tips of long branches. In the stores they were as big as small cabbages. In France and Italy, I discovered a whole range of sizes and varieties—some tiny and purple, some with long, tapering leaves, others squat round balls. And I found out that there are many, many more ways to prepare them than steaming them whole. Nowadays they appear in Vermont markets from March until November, but it seems strange to buy artichokes in September, as it does apples in May or oranges in August. It is even stranger, perhaps, to harvest them in late summer right from my own Weybridge garden. Ever since I stumbled upon artichoke seedlings at Golden Russet a couple of springs ago, I’ve placed a couple in the center of my garden’s sunniest raised bed, given them plenty of room, and watched them grow. The first year I didn’t eat a single one. Instead I watched and photographed: who knew that the bud would eventually crack open to reveal an enormous fuzzy purple flower? Only then did I understand that artichokes are giant thistles not so different-except for the lack of nasty thorns–from those that snag my clothes in scrubby parts of our land. Once I made that connection to a native species, I felt okay about growing what was once a rare treat from far away. My whole notion of local opened up with those flowers. Last year I harvested the whole crop and learned that as with corn, nothing compares to getting them into the cooking pot a minute after harvest. Okay, so Vermont is not the new California. They’re not likely to winter over and produce twenty buds apiece year after year. But what a wonder to bring the Mediterranean into my garden, to learn about the world through growing and preparing food. I’ve been reading about artichokes’ Moroccan origins and role in world cuisine. I’ve experimented with recipes, from shaved raw salads to braised whole artichokes with preserved lemons. I’ve even thought about trying to winter one over by growing it in a pot to haul in come fall the way I do with rosemary and figs. This February I started a dozen artichokes from seed under the basement grow lights. Last week they went into their sunny garden homes near the eggplants and basil, which won’t mind a little shade. As they take 95 days to reach maturity, I’ll be lowering the first ones into the sauté pan round about mid-July. Until then, I’ll gladly head to town in search of those plump buds that herald the arrival of spring as surely as a red-winged blackbird trilling by the pond. It’s too late to start artichokes from seed, but you can still buy seedlings at area greenhouses. 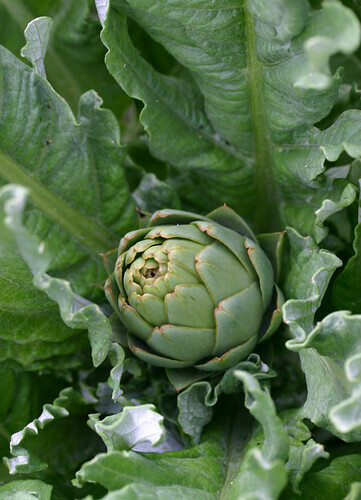 Artichokes like sun, consistent moisture and well-drained, rich soil with a pH level between 6.5 & 7 (a soil test kit will tell you how to adjust the level). Add some compost to the soil, plant them 2 – 3 feet apart and they’ll thank you for it. Don’t worry about cool nights—they need several nights below 50F to produce buds. They can droop after long dry spells but perk right up with a good watering. If buying, look for tightly closed buds with firm stems. Thank you for this beautiful post, I am always looking for ideas on how to use artichokes. Growing up in New York, I thought artichokes came in a jar. My dad liked them. The rest of us, not so much. I learned to eat them as you ate them as kid when I was an Assistant Professor. Do you still do that on occasion? I don’t think my kids have ever tried one. Perhaps over the long weekend we’ll try one of the recipes. Thanks, Robocooker. I look forward to trying out your recipes, too. Lanny, I love that image of you as a kid in NY, thinking artichokes came from a jar. I have never liked those either! Every winter I look forward to the spring arrival of artichokes, and I always prepare them whole and eat them leaf by leaf as I did as a kid before I prepare them any other way. If the artichokes are big, that’s the only way I’ll cook them. I’m interested in what your kids will make of them! I love the sound of the raw artichoke salad with parmigiano! 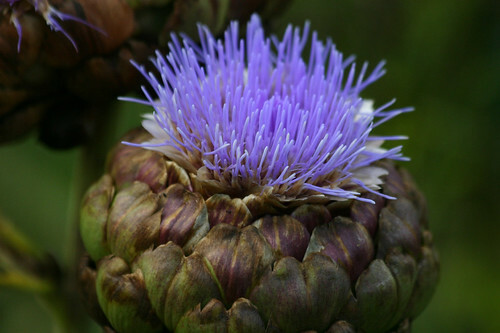 I’m going to head over to the market soon to pick up some baby artichokes and try out your recipe! 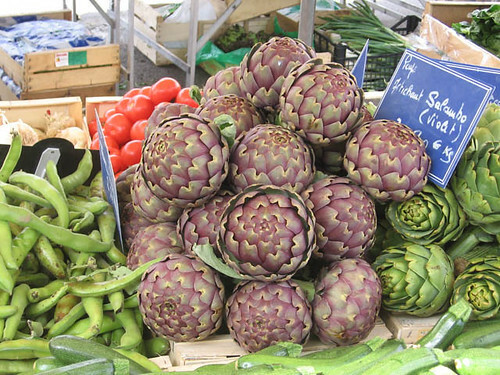 Elizabeth, I envy you that splendid market in Bologna where the table must be piled high with several varieties of baby artichokes not to mention favas–any squash blossoms yet? I look forward to hearing about how your salad turns out–perhaps you will blog about it! Yum! Yes– I made squash blossoms stuffed with fresh ricotta the other evening and thought of you! I’ve always eaten them steamed Italian style, stuffed with breadcrumbs, garlic, parsley, a little parmesan, with just a few drops of olive oil on top. Rumor has it that an old mutual friend of ours brought them to stores in Middlebury. Artichokes were certainly here when I arrived in ’75. Welcome, MEB! That’s a delicious, Lazio way to fix artichokes–yum! Interesting about the arrival of artichokes in Middlebury. They were in the stores in New Hampshire in the 60s, but not in the Northeast Kingdom of Vermont. This speaks to my interest in opening up our sense of local–if we can grow an incredibly diverse array of foods here, might we also become interested in the cultures, the regions, the locales in which they have deep roots and associations? I made your artichoke salad today for lunch– it was delicious! I think I should have removed more of the outer leaves because some bites were a bit tough but I loved the parmigiano and lemon zest! Keep the recipes coming!